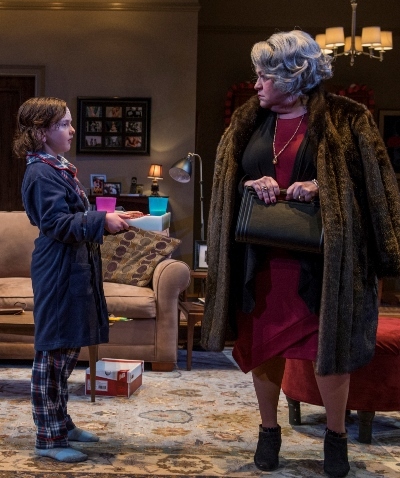 There is a quality, an esprit, about Terrence McNally’s “Mothers and Sons” that transcends mere affirmation of what one might characterize as gay normalcy. 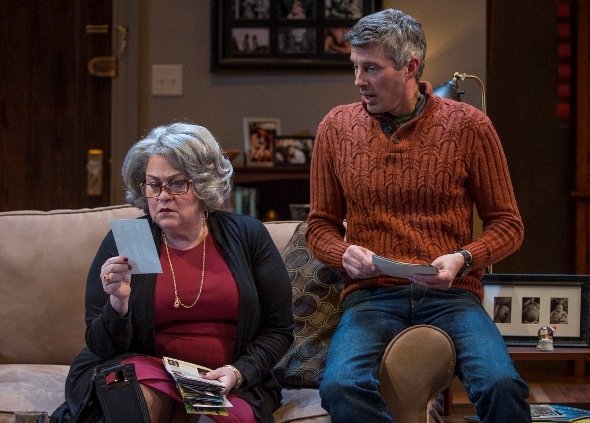 The play, now in a tightly knit and persuasive production directed by Steve Scott at Northlight Theatre, has a spiritually cleansing essence – and a resolute narrative that is nothing short of celebratory. 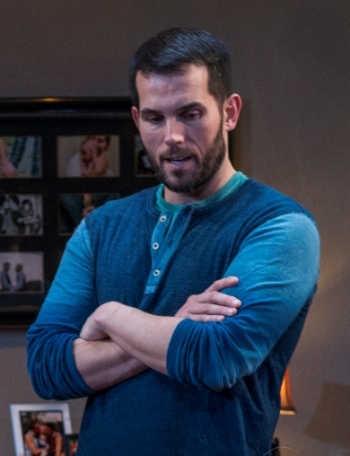 What’s being proclaimed in McNally’s 2014 play is victory and peace after the literal bloodbath that was the gay holocaust, the AIDS devastation of the 1980s. The triumph, of course, is more than one of medicine and health: “Mothers and Sons” trumpets the joy of gay men and women being able to marry, to have children, to live normal loving lives. Well, that’s the Sons part, anyway. It’s the other part, the Mothers, that provides the narrative tension and, viewed from a political perspective, justifies one character’s bully pulpit. Cal, a man in middle age, and Will, perhaps 15 years younger, are married and nicely settled into life in a homey New York apartment meticulously detailed by designer Jack Magaw. They have a little boy, Bud, a happy, well-adjusted kid who’s the apple of the household. Then in walks Katharine, the mother of Cal’s former partner, who died of AIDS. Why she has come is not clear, maybe not even to her. Possibly it’s for that cliché closure. Katharine, played to the stake of rigidity and disapproval by Cindy Gold, is dour, reticent, cold and vaguely accusatory. By her lights, Cal took her son from her and somehow shares responsibility for his death – her son, who wasn’t even gay when he left Dallas for the neon allure of Gotham (read: Gomorrah). 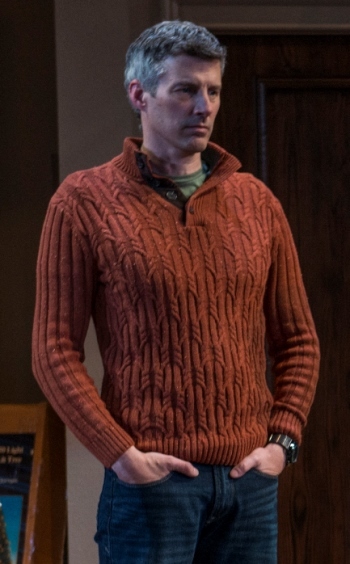 But the play fundamentally belongs to Cal (tall, fit, patient and ardent in the person of Jeff Parker), who embraces the woman’s bitterness, and tries to make her understand his deep love for her son as well as her own culpability in denying the reality of his life. This bizarre debate – earnest and empathic on his side, generally stolid and terse on hers – gets bumped off course from time to time by Cal’s husband. Ah, husband, says Cal to Katharine’s raised eyebrow. It took him a long time to be able to introduce Will, or even refer to him, by that title – the legal and honored one that replaced boyfriend (childish), partner (too much like a law firm), lover (illicit, right?). Benjamin Sprunger’s outgoing but slightly impetuous Will provides a sharp foil for Parker’s restrained, self-assured Cal. Decent role models for little Bud (Ben Miller), both of them. Where Will chafes at Katharine’s sullen hostility, Cal keeps trying to reach her, to explain how it was – not to justify himself but to convey how deeply he suffered the death of her son, indeed how faithfully he ministered to the young man’s physical disintegration. Cal has a box filled with photos of Katharine’s son – André, a strong name, she says, one that couldn’t be diminished by a nickname. She won’t look at the pictures. She remembers her son when he was hers, when he lived at home, before all this. Still, Cal nudges her along. André was wonderful. He was an actor, a great actor, an incredible Hamlet. Had he lived, he would have become one of the leading actors of his generation. To Gold’s immense credit, the softening of Katharine progresses by almost imperceptible degrees; she seems to remain obdurate, but the struggle within her begins to tell. When you’re confronted by a block of ice, the situation demands an ice pick. Cal endures a great deal of Katharine’s righteous superiority, then lashes into her for rejecting her son and for refusing to comfort Cal himself at the memorial service. Why was she so hardened? When the boy playing on the floor with his cars and trucks would call her grandma, Katharine demurs again. She never had a grandchild. Andre was her only son, and of course… But there’s a bedtime ritual in this household. Little Bud brings out Oreo cookies and milk. How simple, how ordinary, how true. Are not Oreos the double stuff of real love, of irreducible authenticity – of normal hearts?